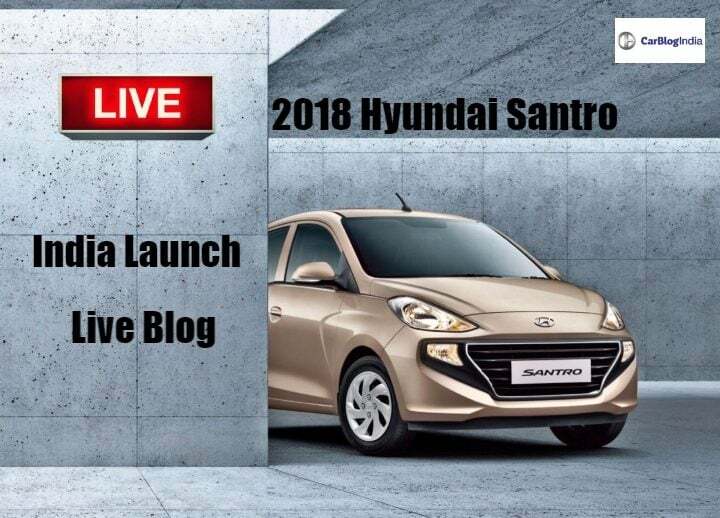 Here is the India launch live blog for the 2018 Hyundai Santro. We bring you all the regular updates straight from the launch event of the new Santro. Keep refreshing the page for all the latest happenings. 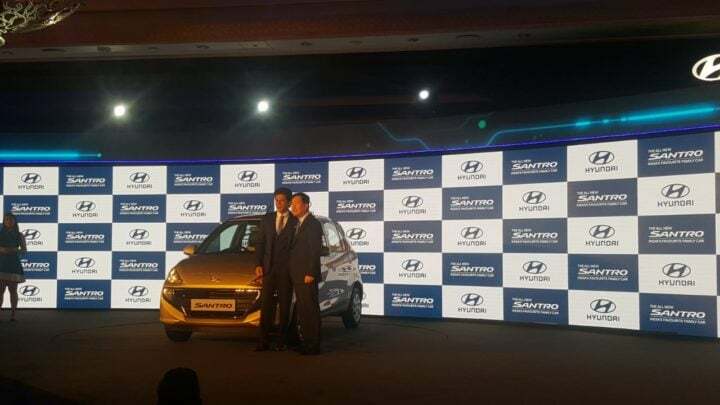 12:50 PM: The event for the launch of the 2018 Hyundai Santro has ended. Thanks for joining us. Stay tuned to Car Blog India for all the latest updates from the Indian automotive industry. 12:40 PM: Prices revealed! The base D-lite variant costs INR 3.89 lakh. Top-end manual version, the Asta trim is going to cost INR 5.45 lakh. 12:35 PM: The 2018 Hyundai Santro comes in a total of 5 variants. These are D-Lite, Era, Magna, Sportz and Asta. Of these, the factory fitted CNG kit will be available on the Magna and the Sportz variants. 12:31 PM: Actor Shah Rukh Khan makes an appearance at the event, being the Corporate Brand Ambassador for Hyundai. 12:25 PM: Despite being an entry-level car, the 2018 Hyundai Santro is no slouch when it comes to offering a decent equipment list. Top-end variants are available with a 7-inch touchscreen infotainment system that offers Apple Car Play and Android Auto. Other features include rear washer and wiper, power outlet to name a few. 12:19 PM: Here it is, in flesh! The 2018 Hyundai Santro makes its global debut in India. 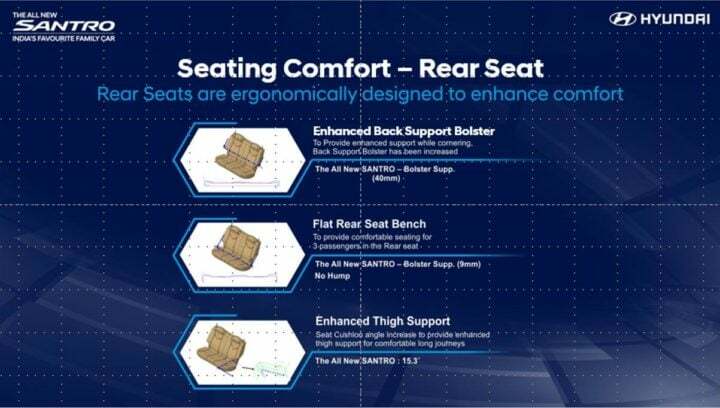 12:16 PM: In terms of safety equipment, the new Santro comes with driver’s side airbag along with ABS and EBD as standard across the range. Also, it comes with dual-airbags only on the top-end variant. 12:12 PM: The structure of the 2018 Hyundai Santro promises to offer high levels of safety to its occupants. It meets the side and frontal crash test and pedestrian protection norms. 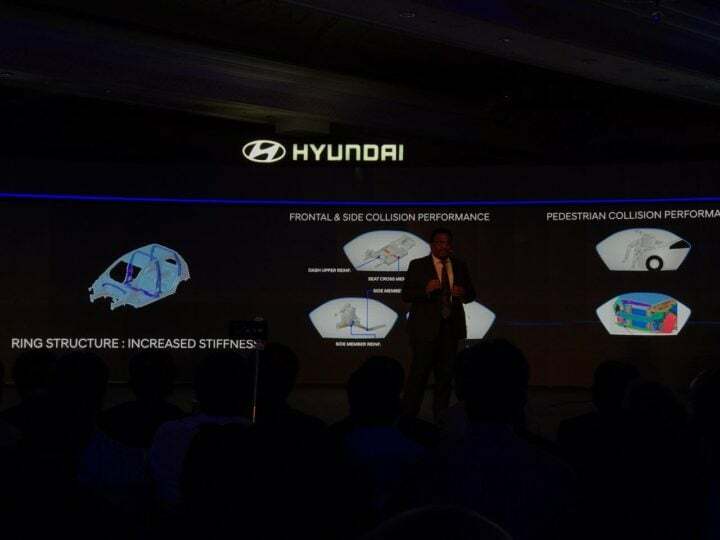 12:08 PM: Hyundai says that they have focused their attention on providing good comfort levels for the second-row seat occupants. Not only this, adding to it will be a segment first rear air-con vent which is available on all variants except the base D-lite variant. 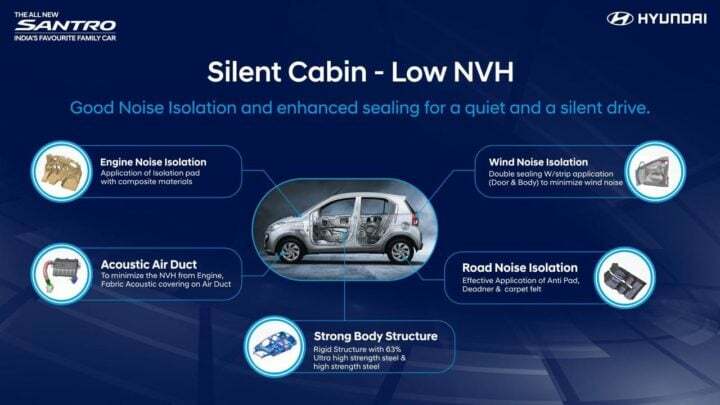 12:04 PM: Hyundai says that they have worked extensively to make sure that the cabin of the 2018 Hyundai Santro offers low NVH levels. 12:02 PM: The petrol engine promises a fuel efficiency figure of 20.3 km/l. This holds true for both the manual as well as the AMT variants. 12:00 PM: As standard, there will be a 5-speed manual gearbox on offer. In addition to this, two variants will also come with a 5-speed AMT unit. 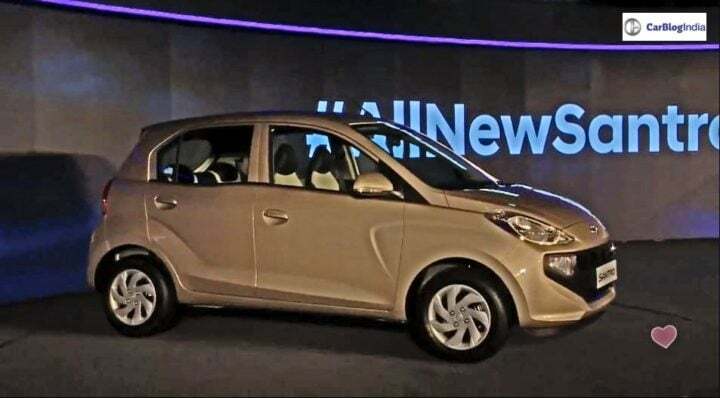 11:55 AM: The third generation Hyundai Santro will go on sale only with a petrol engine in its line-up. This is a 1.1-litre, 4-cylinder unit which is capable of churning out 69 BHP of power along with 70 Nm of peak torque. 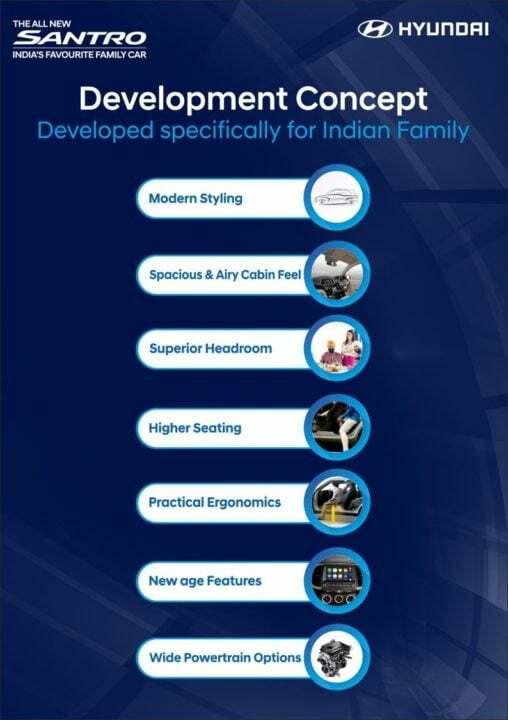 11: 48 AM: The 2018 Hyundai Santro has been designed keeping in mind the needs of an Indian family. Here is this hatchback’s product development chart. 11:30 AM: In addition to the Maruti Wagon R, the new Santro will also face competition from the entry-level hatchback, Renault KWID. 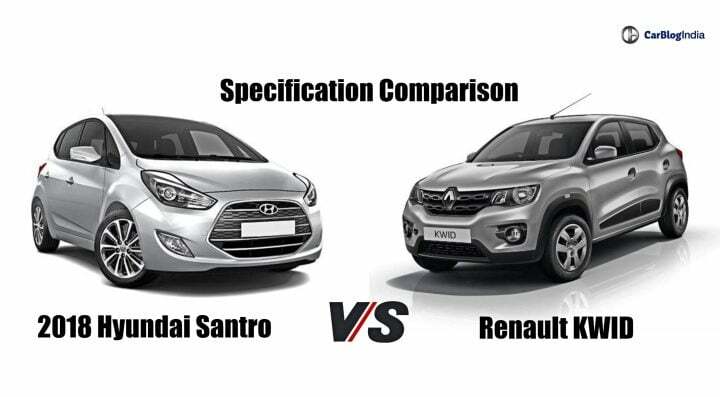 Read our detailed specification based comparison between these two hatchbacks. 11:15 AM: Upon launch, the 2018 Hyundai Santro is going to face competition from one of its oldest competitors, the Maruti Suzuki WagonR. Here is our detailed specification comparison report between these two compact hatchbacks. 11:10 AM: Hyundai is going to completely unveil the interiors of the new Santro today for the first time. However, as units start arriving at the dealerships, a series of spy images have completely revealed the cabin design layout of this compact hatchback ahead of its launch. 11:00 AM: There is still time to spare before the launch of the 2018 Hyundai Santro. As you wait, here is our detailed report on everything that you need to know about this compact hatchback, from expected prices to engine specs and mileage. The 2018 Hyundai Santro is all set to make its official debut in India. The compact family hatchback makes its comeback in India with an all-new avatar. It is based on a new platform which is stronger and promises to offer more space inside the cabin. With a contemporary design, the 2018 Hyundai Santro promises to be the perfect family car for the modern generation. It comes with a stylish dashboard design. The feature list on the top-end variants includes a touchscreen infotainment system, electrically operated ORVMs, day and night IRVMs, rear washer with wiper along with LED turn indicators on the ORVMs. Furthermore, there are rear air-con vents on offer which is a segment first feature. Not only this, but Hyundai is also offering several safety features as standard across the variant range of this hatchback. Driver’s side airbags along with ABS and EBD are available right from the base variant onwards. While dual airbags are available on the top-end variant. It also gets rear parking sensors and a camera. Hyundai is going to launch the 2018 Santro with a 4-cylinder, 1.1-litre petrol engine in India. This gasoline driven engine is capable of producing 69 BHP along with 99 NM of peak torque. As standard, the 2018 Hyundai Santro is going to come with a 5-speed manual gearbox. However, there is a 5-speed AMT gearbox is on offer as well. There will be a total of five variants at the time of the launch. These will be D-lite, Era, Magna, Sportz and Asta. The AMT gearbox will be on offer only in the Magna and the Sportz trims. 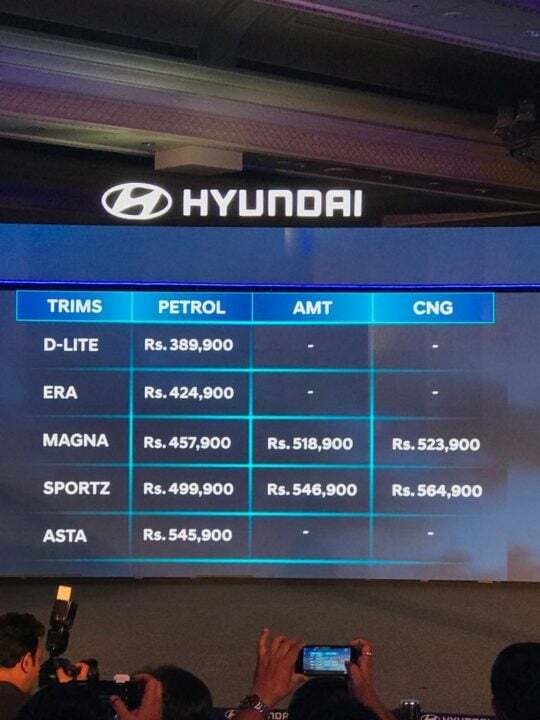 Hyundai is also going to provide factory fitted CNG kits on the Magna and Sportz trims. Hyundai says that the 2018 Santro is exclusively designed keeping in mind the need of the Indian families. As a result of which, it promises to offer a decent equipment list along with a decent cabin space. As mentioned before, the 2018 Hyundai Santro comes with a 7-inch touchscreen infotainment system. This unit is only available on the top-spec Asta trim. It comes as standard with Android Auto and Apple Car Play connectivity. Not only this, but it doubles up as the screen for the rear parking camera as well. Ahead of the launch, the prices of the 2018 Hyundai were leaked on the internet. Going by these, the base D-lite variant is likely to cost around INR 3.87 lakhs. On the other hand, the top-end variant will retail at INR 5.29 lakhs. 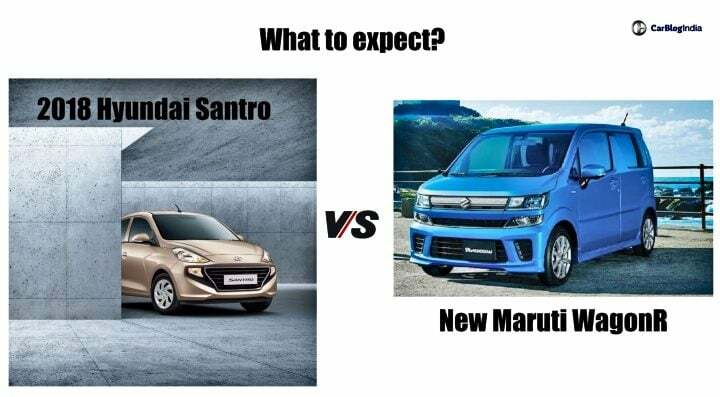 For all the latest information on the new Santro, stay tuned and keep refreshing the page.